It’s gorgeous. But who is this high-end Kindle for? What is the Kindle Oasis (2017)? It’s been a busy time for Amazon, with the company unveiling a shed-load of Alexa-toting Echo speakers, 4K HDR TV dongles and Amazon Fire tablets. But one particular product has been missing from the ramble: a new version of the Amazon Kindle. Since there hasn’t been much by way of disruption to the Kindle e-reader’s dominance this year, Amazon appears content to keep its budget options as they are this time around. Instead, the company is updating its higher-end Oasis reader. When the Kindle Oasis first launched, it was clearly a luxury product. While it struggled to up its offering next to the cheaper Kindles in terms of functionality, even lacking in some areas, it at least looked gorgeous. Although functionality isn’t an issue anymore, the Oasis might still prove a hard sell. Prices start from £229/$249.99 for an 8GB model and £259/$279 for the 32GB version. There’s a 3G option available too, which is a 32GB model for £319/$349. It should be noted that the US version comes with adverts on the lock-screen; this doesn’t appear to be the case with the UK version. The second-generation Kindle Oasis fixes the majority of problems seen with the first iteration. But more exciting is the fact that it offers features that we haven’t seen on any Kindle before. 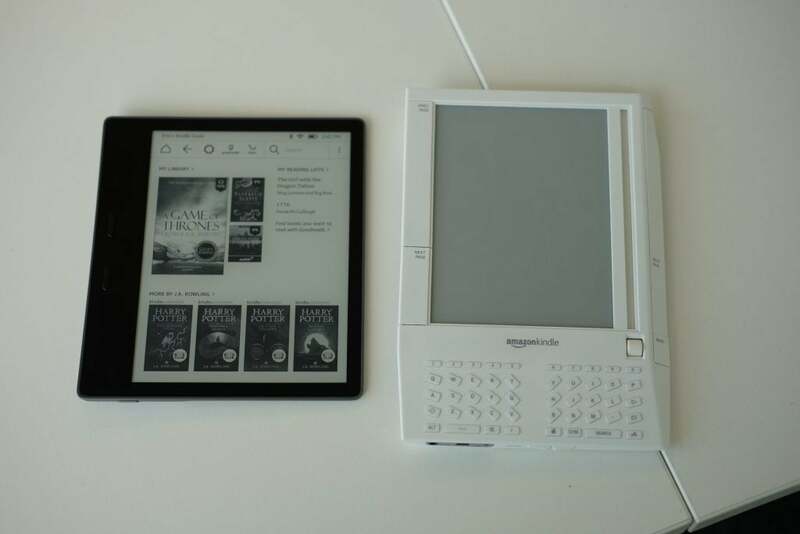 Like the original Oasis, the Oasis 2 looks visibly different to the other Kindle models. The screen sits to one side, next to a duo of physical page-turning buttons. The device is somewhat bulbous beneath the display, slimming out to a very thin point. This provides something to clutch onto, and is also where the battery and other internals reside. The design does take some getting used to, especially if you’re coming from a more traditional Kindle model. The combination of a thick and thin bezel around the display make it uncomfortable to hold with two hands, unless you invest in one of Amazon’s cases. It’s fine in one hand, although I much prefer the feel of the Kindle Voyage and Paperwhite. Nevertheless, after a few days of use I had adjusted to the new Oasis. The first iteration of the Oasis came with a small battery inside the device, and a much larger one fitted to a leather cover supplied in the box. Although it worked okay, it limited you to using that particular case. 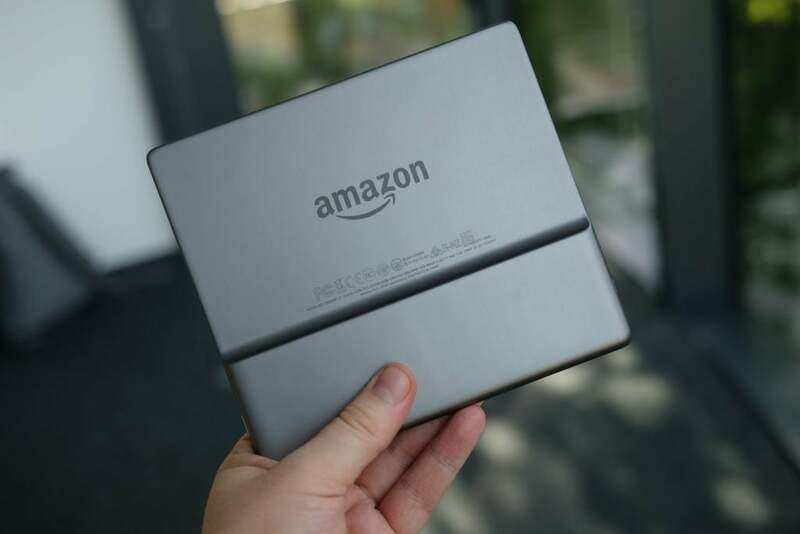 Amazon has removed the need for the case with the new model, instead fitting a much bigger battery inside the Kindle Oasis. The lack of case has led to a few other design tweaks too. The rear of the Kindle Oasis is now aluminium, rather than soft-touch plastic, and gone are the visible pins that were previously used to charge the case. The design feels much cleaner and classier, but issues remain. Previous Kindles have all felt soft to the touch, but the new Oasis is harsher. The aluminium sides jut out slightly above the display and the edges are sharp. It’s a colder, less welcoming product, and I’m not entirely sure everyone will like it. Over the years, I’ve longed to have a Kindle that I can happily leave by the pool without fear of it becoming damaged by water splashes. Finally, Amazon has added water-resistance to the Oasis’ list of features. An IPX8 rating means the Kindle Oasis (2017) will happily survive being submerged in water for two hours – which is more than most phones boasting an IP67/8 rating. Alongside the addition of waterproofing, the new Oasis (2017) also includes support for Audible – the Amazon-owned audiobook store that has pretty much become the main way to buy and download audiobooks. If you’re already in the Audible ecosystem, previously purchased audiobooks will show up alongside your regular books. If you own both the Kindle book and Audible audiobook then they’ll show up as one; you can switch between the two with the tap of the button. It’s a seamless process that works as advertised. Obviously, though, buying both versions of the book will be pricey. Those who aren’t already signed up to Audible can do so via a web browser, and the service offers both straight-up purchases and monthly subscriptions with a certain number of credits included. There’s now an Audible store on the device for downloading and buying audiobooks, but it isn’t integrated into the regular Kindle store. Note that the Kindle Oasis 2 has no headphone jack or speaker. Instead, you’ll have to use Bluetooth headphones or a Bluetooth speaker. Pairing a Bluetooth device is straightforward, but trying to connect to a pair of AirPods resulted in failure multiple times. Once connected, however, the reception was strong even with the Kindle in my bag. Elsewhere in terms of the software little has changed, with each of the Kindles displaying the same basic user interface. 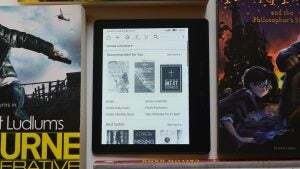 Unlike most other Amazon products, there isn’t a huge push of adverts on the Kindle devices. While it does recommend other reads, and of course it’s only possible to download books from the Kindle store (unless you want to employ some finicky workarounds), you won’t be bombarded as you are with the Fire TV. Another big design change with the Kindle Oasis 2 is the switch to a larger 7-inch screen, rather than the 6-inch display on the first device. Although this makes the Oasis 2 less pocketable, the bigger panel and roomier viewing area is a worthy trade-off. The screen itself retains the 300 pixels-per-inch (PPI) of the outgoing Oasis, but it finally adds in the auto-brightness option that debuted on the Kindle Voyage. This automatically adjusts the intensity of the front light according to the environment you’re in, and it means you won’t have to go into Settings to make adjustments when moving from bright conditions outdoors to inside a more dimly lit train. In use this feature isn’t as smooth as it is on a phone, but it’s certainly a handy addition nonetheless. The light that brightens the display for nighttime reading is also excellent; there are now extra LEDs to provide more even light. As mentioned, the battery unit in the previous edition of the Kindle Oasis was small, with much of the power supplied via the included charging case. This was great idea, but not so much in actual use. In my experience, without the case attached the Kindle would barely last a day – and the device would frequently prompt to charge, even when the device’s battery was full. With the Kindle Oasis 2, Amazon claims about 6 weeks of use – but judging the accuracy of this figure can be difficult. During my time with the device it lost about 15% after five days, which comprised a few hours of reading per day. As you’d expect, the battery will be consumed quicker when listening to audiobooks through a pair of Bluetooth headphones. But, it will still offer far more juice than using your phone. There’s isn’t a charging block in the box, just the cable, which does seem a little tight for a device costing upwards of £200. Amazon has also stuck with micro-USB, rather than switching to the now more common USB Type-C. This is hardly surprising, however: Amazon hasn’t converted to USB-C yet with any of its products. Nevertheless, for a product that’s unlikely to see an update for a few years yet, it’s disappointing. Why buy the Kindle Oasis (2017)? 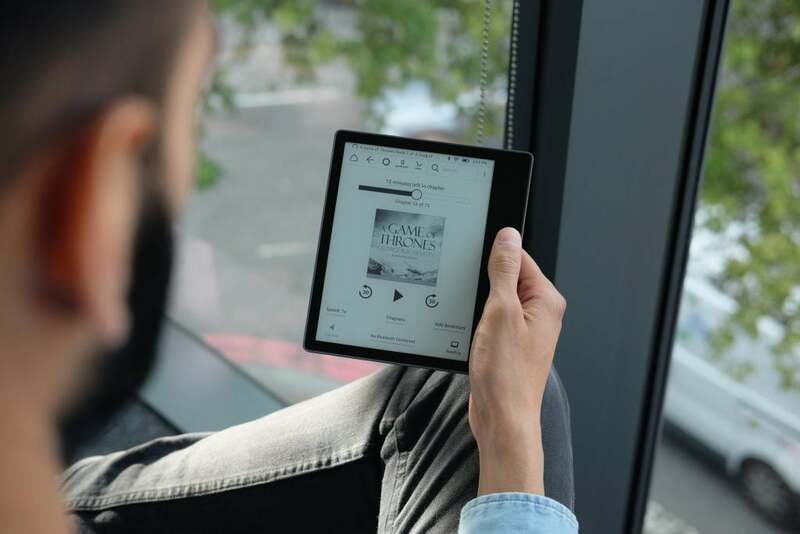 Water-resistance and Audible integration have been two of the biggest features missing from previous Kindles, so their additions here instantly make the new Oasis an interesting proposition. 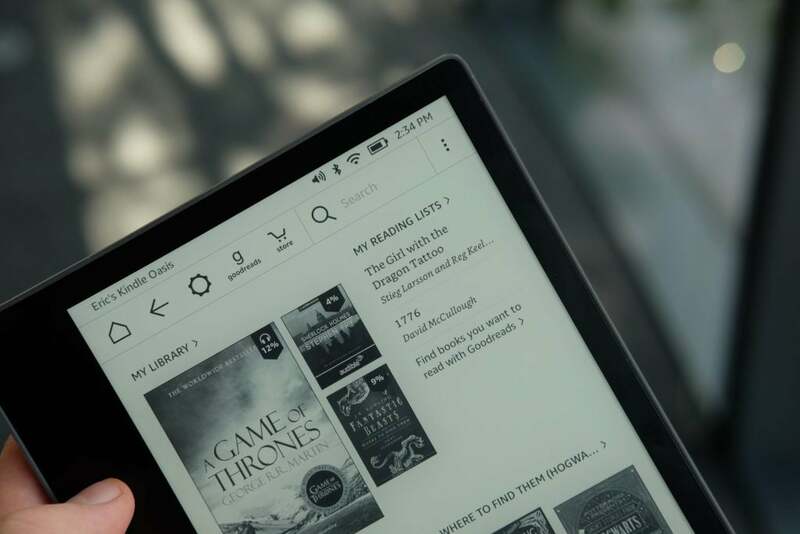 However, with prices starting at £229 for an 8GB model and £259 for 32GB, the Oasis remains a pricey product that’s likely to attract only the most obsessive of Kindle fans. Nevertheless, having features that actually set the Oasis apart from the £109.99 Paperwhite at least make it an easier sell than the previous model. 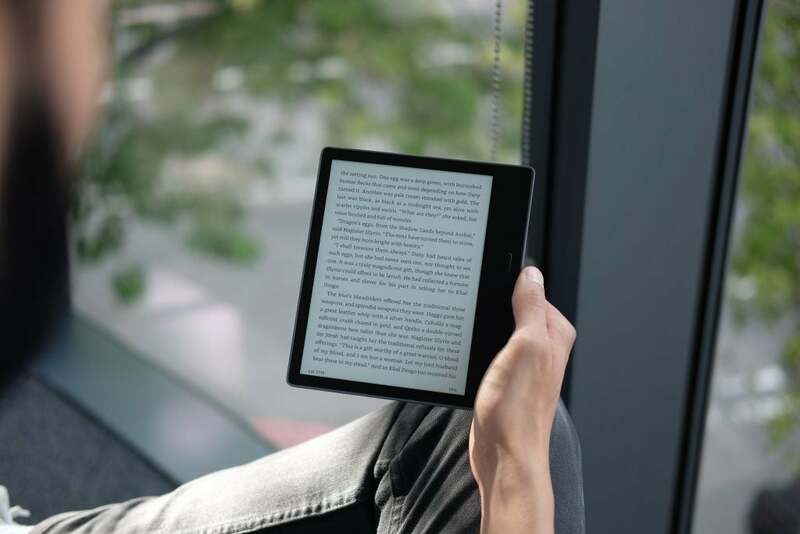 It’s expensive and a few of the design changes won’t suit all, but the bigger screen and waterproofing make it the perfect choice for die-hard e-reader fans. The post Kindle Oasis (2017) appeared first on Trusted Reviews.